Site Description: Large sand dunes and cliffs overlooking a huge surf beach. Ideal for training and early soaring. This site is in the middle of a popular holiday destination so can be busy in the Summer months. How to get there: From Perranporth go NW on the B3285. At the top of the hill turn left onto the Holiday Centre approach road. Check in at the Holiday Centre Reception Office then follow the map below. Vehicle Access & Parking: The Management of the Holiday Centre need to control vehicles entering their property. Pilots may park in the area to the North West of Take off adjacent to the caravans, marked with posts or to the South of the flying area. The parking area to the South of Take Off is usually used by HG pilots as it is closer to take off and adjacent to the HG rigging area. If these areas are full, park in the Holiday Centre Day Visitor car park. Parking Tickets are now required for all vehicles entering the Holiday Centre Property. Please note that the Holiday Centre is closed on Christmas Day and New Year’s Day so there is no vehicular access to the site on either of these days. Rules and Restrictions: Always ring Perranporth Airfield on arrival at the site, tell them you are there and you are hoping to fly. Perranporth ATZ starts about 100metres South of take off, their telephone number is: 01872 552266 (flying club) or 01872 552856 (café) try both numbers. 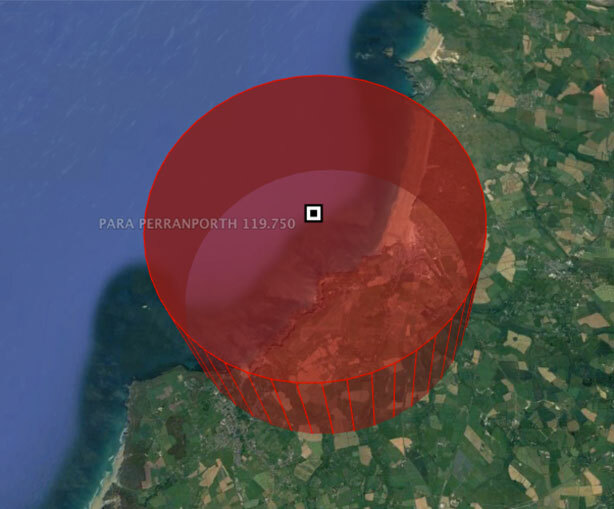 Please also note: There is a permanent parachute drop zone which extends up to 15000′, so a little tricky to fly over and lies pretty much on our preferred XC route from Chapel Porth to Perran. However, para- chuting does not take place all the time, and by contacting the Cornish Parachute Club you can find out if they are active or not. If no information is available from the airfield call the Cornish Parachute Club on: 07790 439653. Guidelines: The site is used for HG & PG training, be aware of red ribboned pilots and give them space. Keep the launch and landing areas clear of gear. Because of the challenging landing conditions of the site, paragliders (except those under tuition) are advised to refrain from ground handling when busy or when hang gliders are flying. When launching ensure you are clear in front, above and behind. Paragliders, speed/mini wings should be especially aware of hang gliders launching and landing on windier days. Avoid flying low in front of launch. The ridge is 1.5 miles long, on busy days, spread out and don’t hog the area in front of take off. Do not interfere with the access or enjoyment of the public and particularly customers of the Holiday Centre on whose goodwill we depend for continued use of the site. Rigging Notes: Keep clear of landing and landing approach areas. Paragliders are advised to prepare in the bowl and rig to the North of take off, hang gliders should rig to the South of take off behind the sand dune. Marshalling: Use common sense and consideration for others. Launch Notes: Watch for other pilots launching or landing or approaching to land. Top Landing Notes: HG pilots must be aware that the site slopes toward the sea and top landing in lighter winds needs care. On approach NEVER fly over or behind the caravans where there is sink and rotor. Bottom Landing Notes: Easy except at highest tides but watch the wind direction along the beach. Hazards: Sink and rotor above and behind caravans. Do Not over fly. Watch for military helicopters operating with the military training area to the north. Radio controlled model aircraft and kites are often flown from the dunes. Restricted Areas: Perranporth Airfield ATZ.